Saturday. The Royal Highland Hotel by the station in Inverness. The foyer/bar/café. It’s called the Art Gallery café. Three large computer-generated portraits on the landing above a central flight of stairs and some dark old masters along the walls (originals?) justify the name. I suppose. I wasn’t that impressed. I’ve retreated here to shelter from the showers and the shoppers. After four days on retreat in the quiet hills above Loch Ness, being back in busy city streets is a shock. The salad of herbed tempura vegetables and mixed leaves, a surprising offering in this locale, and the graciously appointed ladies loo with its deep-pile carpets, massive mahogany table and spotless mirrors, were welcome as treat and retreat before boarding the 14.42 from Platform 3. On retreat? In retreat? Amounts to the same thing whatever preposition you use. Getting away from it all for a while, escaping from the front line to live a monastic existence. 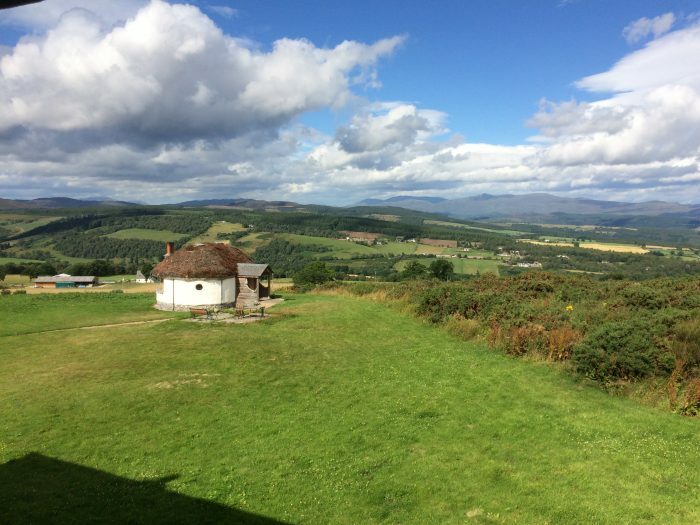 At Moniack Mhor, Scotland’s Creative Writing Centre, a small room with bed, desk and chair, meals at fixed times eaten together with other retreaters and the cooking and clearing-up rota, give a touch of the monastic. They also make for a simple, communal life. No vow of silence, though. Over four days a sense of camaraderie developed among 13 of us. Intense discussion, frequent laughter and the fast-acting glue of a common endeavour. From such different places and stages in life, so it was in our writing. From Australia and Fort William and many places in between. From twenty-something to nearing eighty. From the fifth draft of a full manuscript to the smallest kernel of an idea and barely a word on the page. Yet there was a sense of common endeavour – each of us needing space to think or help with a dilemma. Or both. I wonder what makes these things work? Good tutors? The homeliness of the environment? Generous staff? Plentiful food? A beautiful landscape? The opportunities to be alone? The chance chemistry of a random group of individuals? The fact we were strangers to one another, free from pre-existing attachments? The likelihood that we will never come together again? Be open – what’s to lose? Maybe there’s lots to lose. Non-fiction writing is, mostly, a close encounter with the self. The questions are deeply personal. You can lose confidence. If you’re uneasy about what you’re doing, being surrounded by people pursuing their projects purposefully can make you doubt. Opening yourself up to feedback from experts, who’ve travelled the road before you, can throw you off balance. Especially when they seem to hit the nail on the head. Shed light on the very thing you have known deep down but haven’t managed to acknowledge. On retreat? It’s an odd notion. You escape your everyday and confront some of the questions you mostly neglect. Though maybe that’s not what you expected to do. It’s disconcerting. A little exhilarating. I still have no idea what makes it work nor how long its magic lasts. Thoughtful writing as always Lizzie. Love from us both. We stayed at The Royal Highland Hotel in Inverness the night before getting the train to Skye where you & Jim kindly picked us up. So this Blog had a special meaning for us. I admire you for taking that creative writing course and it sounds like it worked for you on a personal level. At least, that’s the impression I got! Tony & Val.. I really enjoyed this piece, especially after hearing you talk about the retreat. I loved the descriptions and the questions, and the pace of the piece. There an interesting juxtaposition of solitude and camaraderie, of focus and withdrawal, implicit. Maybe those are some of the factors that makes it work?